Possess an Integrative mind. A CIO who can see and connect the dots. Are Life-long learners. This factor is seen as the strongest predictor of success across any industry. These first two factors often accompany someone who has been successful in many environments and has a globally diverse experience base. The right candidate will understand the requirement of modifying behavior to achieve impact in differing market settings and cultures. Create a compelling vision, focus the organization around that vision, and execute on it. Great communication skill goes hand in hand with this. Build and motivate teams. Top CIOs are able to attract top talent and challenge them to perform at exceptional levels. The most successful teams are often cross-functional and multi-cultural, and the leader is able to capture the collective intelligence of the organization in solving business problems. A buzz phrase here would be ‘encourage the heart’. Cloud (SaaS, PaaS and IaaS). Social (e.g., crowdsourcing for helpdesk and product development). Mobile. Delivering organizational capability and products in a mobile world. Big Data and Small Data (analytics for zero unplanned maintenance, product innovation, business performance improvement). Consumerization and BYOD. (Flexibility, customer satisfaction and cost management). Develop a deep knowledge of the business. This often drives candidate selection toward industry insiders. However, there are notable successes where candidates from different industries have had enormous and enduring impact. I placed Phil Fasano at Kaiser Permanente. He came from Financial Services and brought organizational change skills and forward-thinking capability that have made him a standout leader. He has now been at Kaiser for six years, and not only has he revolutionized the way KP does business, but he is also having impact on a global scale. Phil recently published a book entitled “Transforming Healthcare, the Financial Impact of Technology, Electronic Tools and Data Mining”. Not bad for a guy who used to worry about your credit card balances! Have strong influencing capability. Top quality CIOs understand that they need to deliver a functional operating platform, but as important is their ability to work with business unit heads to help drive value. A CIO must understand operational goals, and explain how technology can either enable or improve business outcomes. He or she can then push to the front of the bus and help with revenue generation activity. Are trusting and trustworthy. A capable CIO must develop strong relationships across the business. We have found that leaders who have a strong EQ (emotional intelligence), and are principled in approach, have enduring impact. Tying into my “No Better Time” Blog (posted 5/14/13) addressing the top line, this Blog will focus on the bottom line. Another way to say this is how does the CIO get leverage from what he or she does? There is leverage from scale, and from being more efficient in the way the business is done (process harmonization). Keep the lights on. Sorry to start with this, but if you don’t offer a great service to the organization you won’t be taken seriously at the top. Your stuff has to work – all the time. Get sourcing right. Negotiate effectively with vendors. I have seen a lot of contracts go wrong because CIOs were too hard on vendors. Vendors can really help. Let them make a fair buck. Analyze IT demand and build a plan that delivers the capacity you need without getting trapped in technology dead ends. Cloud now offers amazing opportunities to manage this equation and deal with spike demand. Get your IT standards in place. This is often about architecture and balancing control with innovation. BYOD. May not save you as much as you expect, but the plain truth is that Consumerization is an opportunity that CIOs need to embrace. And let’s face it; the consumer-oriented products are way cooler than what the enterprise offers! Harmonize process. There are great opportunities when a new platform is installed to harmonize business process and reap organizational efficiency. The CIO can be a major player in getting this right. Embrace the Cloud. Cloud offerings in applications, infrastructure and platforms can have an enormous impact on an organization. Figure out what is suitable and make it happen; you can free up $ in base cost and offer some really cool stuff. IT Governance. It is important, and will catch you out if not done right. Get the right level of business participation, have decent portfolio management – so the IT spend is understood and committed to, and then execute well. Security. Increasingly important with Cloud, Consumerization, Social and Mobile. There are just so many more ways the bad guys can infiltrate. This keeps the CEO up at night, and if you get it wrong, you are out of a job! There is, however, a balancing act that the CIO needs to understand that hinges around centralization vs. decentralization. Some IT shops want everything centralized for maximum security, cost management and control, but business users typically want IT decentralized for increased speed and flexibility. What’s a CIO to do? Sorry, there is no simple answer here. It all depends. For the top line stuff – growing revenue – he has adopted a more decentralized strategy. So the new products and new markets initiatives that I referred to are very decentralized, then as those new products are adopted into the organization there is more control. This ensures that customer satisfaction and experience standards are met. When the products become more mainstream, they are standardized for process and operational efficiency and finally, when the products are commodities, the focus moves toward bottom line cost management. It’s a great way to think about lifecycles. You probably don’t have Randy’s scale and scope so his example may not fit, but the positioning of your IT department on the continuum of “total control” to “anything goes” needs to be thought through carefully. The lesson to take from Randy is this – the centralization versus decentralization challenge is not uniform across an organization, its products and processes. You need to decide what approach makes the most strategic sense for your company right now. Kim Stephenson of Intel has a really interesting quote around this – she says “there are no IT projects – only business projects”. This is a great mantra, and key to understanding your role as CIO. You are there to add business value. I believe that there is “No Better Time” to be a CIO than now. If there is one role in the executive suite that will have impact in the next five years it is that of the IT leader. There has been a lot of discussion about what the “I” in CIO should stand for (Integration, Innovation, Intelligence, etc.) but more on that in another blog post. The CIO can drive both the top and bottom lines of an organization – we just have to get our ideas out, and be effective players in the leadership team. It’s all about adding value. 3. How to be effective on the leadership team – leadership traits of great CIOs, strategies for effectiveness, etc. 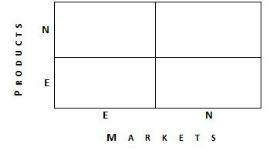 Think about where you can add value using the simple matrix: Existing Products in Existing Markets then expand to New Products in Existing Markets, Existing Products in New Markets and New Products in New Markets. Spend time with customers. Talk to clients and your counterpart CIOs to understand their challenges. You are not coming with a “salesman” card, and can be really useful to your organization if you are listening to the customer and know your own business. Eat your own lunch/drink your own Champagne. Many IT departments are test beds for their company’s new products – and then become key in selling those products externally. Particularly true for technology companies (maybe not so effective for restaurant or winery business – pun intended!!). If you don’t do this – see if there is a way to get on the revenue generating side of the business, so you are not just a cost center. Develop analytics capability. This can uncover real value – see matrix above. There is a lot of talk about how the CMO and CIO may be at odds. This may be the case if you are not leading. Go to the CMO, show what analytics can do for product, revenue stream enhancement, customer analysis, etc. The opportunities are enormous. Big Data. Kind of the same point as above, but not quite. The above point was “Small Data” and many companies still have to figure out what to do with what they have. Get the architecture right, and then select a decent analytics partner. Once Small Data is conquered then move to Big Data. There is a lot of hype now, but the opportunities are amazing. Check out what Bill Ruh is doing with his GE group in Silicon Valley; which is one of the more compelling use cases for big data that I have seen. Mobility. Many customers want the option of dealing with you from their smart devices. This is a great opportunity for IT to be a leader in tapping into new revenue streams. Social. A lot is being written about how social business can drive both the top and bottom line. Think this through and get a plan in place. There are some amazing ways that social platforms are impacting organizations; because this is the way people get stuff done. I believe that this is one of the ways that the cost of healthcare can be reduced – by managing habits and choices via social media so that people live healthy lifestyles. Be thoughtful about how you participate in acquisitions. Many organizations need to grow by acquisition, and the IT leader can have key strategic input in explaining (or motivating) how an acquisition can be synergistic from a product and market perspective. You will need to integrate the company being acquired – so think that part through clearly as well. Put a playbook in place. Be a key facilitator around innovation. Depending on the nature of your organization you are either a key driver of this, or need to create the environment to allow innovation to take place. Much of today’s innovation is technology enabled – so you need to know your industry, understand the drivers impacting it, and then create a world that fosters innovation. This is a big topic, and one for another time, but there are two potential paths to success: bottom up or top down. I will unpack these in a future blog. Execute. Get the right platforms in place – then harmonize and leverage business processes to deliver to customers in the most effective way. More on this in the next blog. Work across the business to ensure speed. Some pundits want to rename the CIO – Chief Acceleration Officer – silly perhaps, but the concept behind the name is excellent. Velocity is really important. Customer service. IT can play a key role – using technology. Figure out how you can make IT a strategic weapon in the delivery of customer service. Continuous product and quality improvement. Through analytics, innovation, etc. The constant question the CIO should ask in both finding and keeping customers should be this – how can I add value?